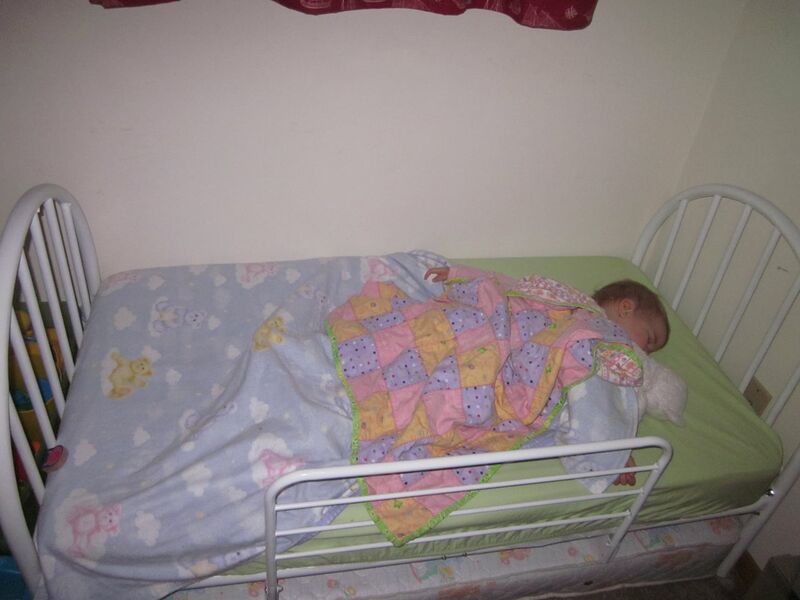 Before Christmas someone was giving away a crib/toddler bed mattress on freecycle. I went ahead and asked for it since I figured we’d be needing a toddler bed sooner than later. 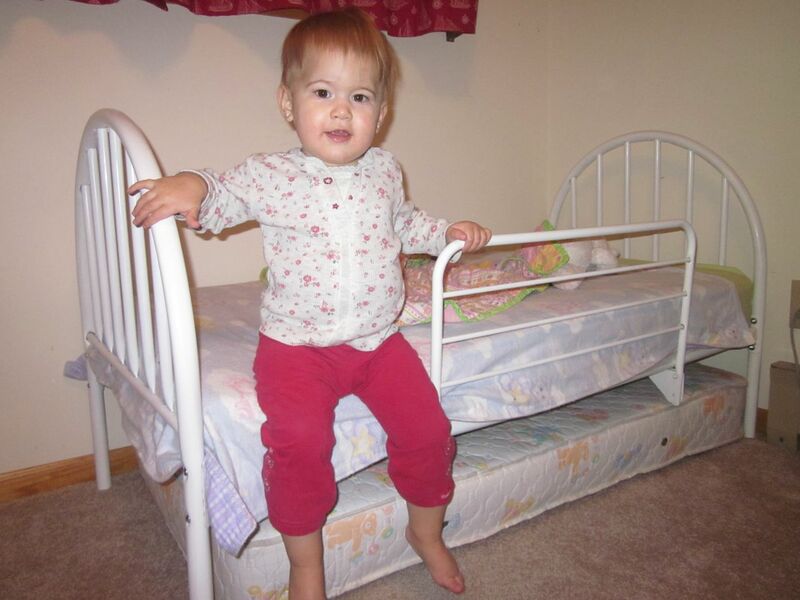 I got the mattress hoping that someone would be giving away a toddler bed frame later on. 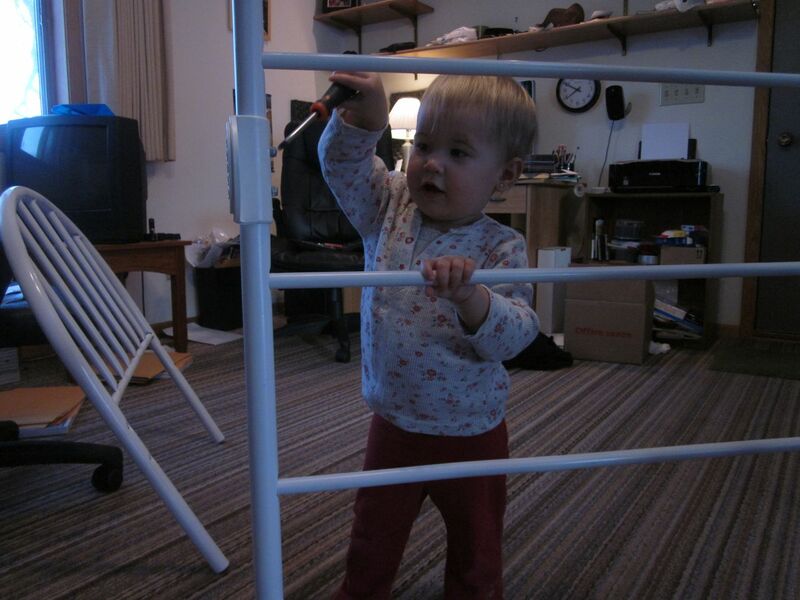 Last week I figured I’d go ahead and ask for a toddler bedframe on freecycle, and someone emailed me to come get theirs! It needed some paint, and we had to go buy screws, but other than that it’s in great shape and a really sturdy bed. They also offered me the mattress they had for it, which is in better shape than the first I got, so I went ahead and took it. 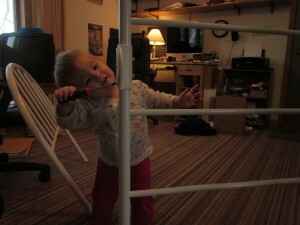 Hannah was so excited about all the random pieces of metal around Daddy’s office. She couldn’t leave them alone, and was even more excited when I gave her a screwdriver to help us. What a cutie! She really got in to her work. Finally in her room with sheets and blankets, and complete with the extra mattress underneath for a sleep over. She ran out of patience while Tim and I quickly threw everything on. Hannah kept climbing up and down, up and down, and running over to Tim and I to give us hugs. It was so cute to watch her excitement. Hannah is almost 18 months old, and spending her first night in a big girl bed. How is this so? 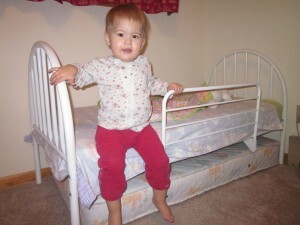 I called my mom to get some tips on how to transition Hannah into the new bed. So Tim laid Hannah down under the covers, read her some books, and she was out. This went WAY easier than I would ever imagine. It could have to do with her staying up past her bedtime and starting to get a little cold. But her first day to see her bed all put together, she is asleep for the night in it. Crazy! Now we’ll just see if this continues and if nap times work as well. Sr. High Girl’s Bible Study starts tomorrow!